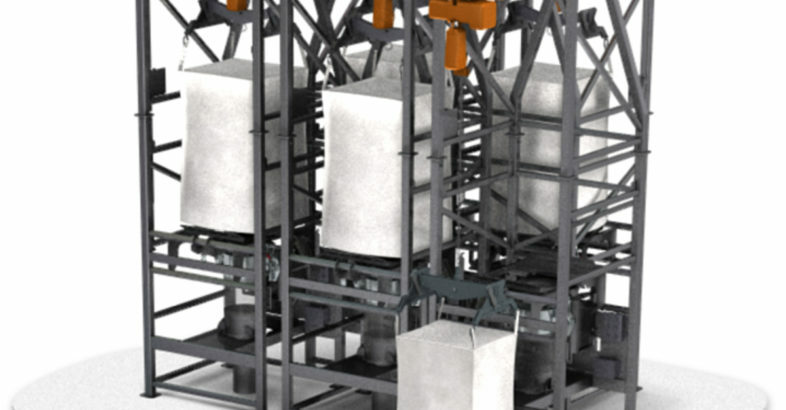 This 5-station, bulk bag unloader system combines high-capacity structural construction with a centralized controls and automation architecture to safely and accurately supply to downstream process operations a total of 12 million pounds-per-year of five, combustible input ingredients. Each bulk bag unloader station is constructed of thick-wall, 6-inch by 4-inch carbon steel structural tubing, and heavy-gauge carbon steel plate to meet, or exceed, ANSI and ASME specifications. The controls and automation architecture of the 5-station system uses custom PLCs and HMIs engineered, programmed, and built by NBE to integrate to the process facility’s central control system, while also complying with international standards. Each bulk bag unloader station is constructed of thick-wall, 6-inch by 4-inch carbon steel structural tubing, and heavy-gauge carbon steel plate to meet, or exceed, ANSI and ASME specifications and ensure reliable, low-maintenance operation during virtually continuous-duty operation. The controls and automation architecture of the 5-station system uses custom PLCs and HMIs engineered, programmed, and built by NBE to integrate to the process facility’s central control system, while also complying with international standards. The five different material types range in bulk density from 150kg/m3 to 630kg/m3, each with varied, non-free flowing material characteristics. Each NBE bulk bag unloader uses two integrated, hydraulic massage paddles with 2,200 pounds of paddle pressure to condition the material and aid material flow. The combustible materials move from the bulk bag through the NBE E3™ enclosed bag spout interface where, with the closed-cycle dust collection system, migrant material generated during bag unloading is collected and re-introduced to the process flow. 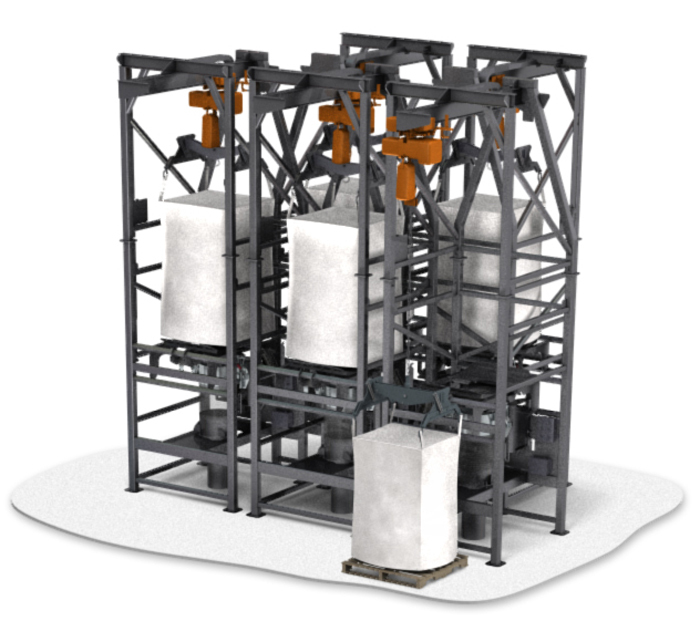 The E3™ also works during bulk bag unloading to elongate the bulk bag to further ensure complete material discharge. Operator exposure to these materials was eliminated, and operator physical ergonomics were optimized as a result of rigorous NBE risk assessment procedures. NBE expertise in specifying, designing, and manufacturing process systems to application-appropriate codes, standards, and regulations ensured system compliance at start-up.